I prepared this block yesterday so I had some hand stitching to do while watching the Olympics. I am watching the team skating. This little block will measure 6" when sewn in. 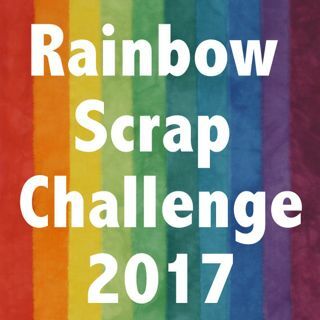 It will be a sampler I will work on this year as part of the Rainbow Scrap Challenge. The hexagons measure 1" on a side. They seem so big. I have done 3/4" mostly in the past. 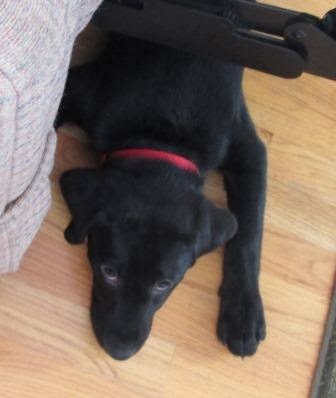 Gemma had a big sprint around the house and is now slowed down and sleeping under my chair. Our weather is very cold so we did not have a good walk yesterday and I am sure we will not get a good walk outside today either. ENjoy stitching with the Olympics! Very pretty block! I am doing the 1 inch hexie's right now and love them. The yellow pop of color in the middle just makes me smile. Very nice! 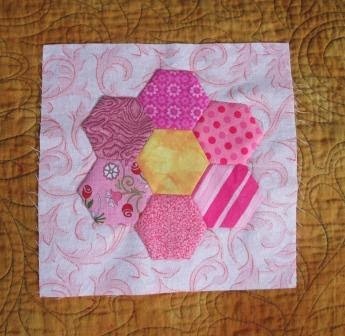 Is the hexie block appliqued to the solid block? Or is there a different technique to this?